If you are a golf professional or a golf course manager seeking SEO or social media services please reach me at jwojdylo@gmail.com. The golf industry is admittedly behind the times when it comes to all things technology. I am a member of a prestigious Toll Brothers course in North Carolina and they just created a website for the members last year; in 2013! There are many golf courses that would love to add new members or simply book more tee times. One of the best ways to get ahead of the other golf courses and golf course communities in the area is to embrace the changing environment of the way people search for entertainment and sporting events. Golf is both! Ranking in Google search is very important as it allows golf courses exposure to golfers that have never played a course or know it even exists. 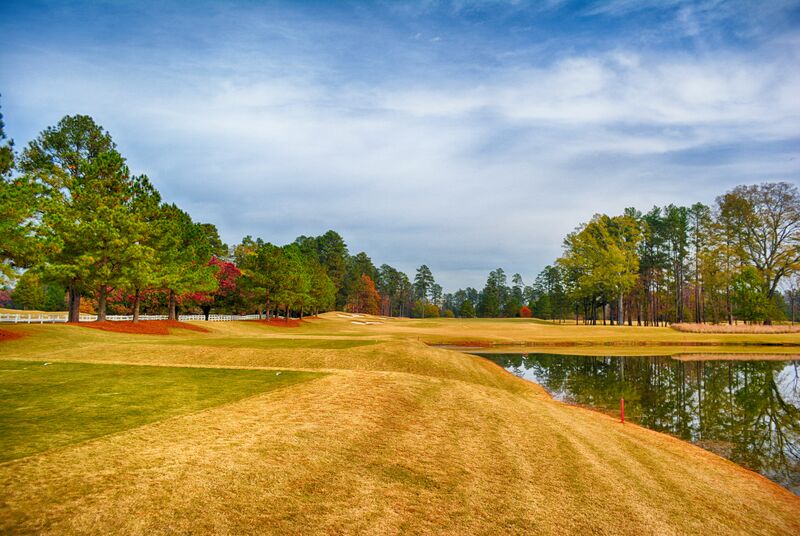 When I started my golf career I would look for “Raleigh Golf Courses” all the time. In fact, I would look up the golf keywords or keyword phrases “Short Raleigh Golf Courses” or “Beginner Golf Courses in North Carolina” because I did not want to play that 7700 yard beast of a track. For the first two years of my golf career I only played courses I found online. Word of mouth was not available to me because I was so new to the sport. After a few years I started to learn about other courses through fellow golfers but it took awhile for me to gain this type of access. This is why it is imperative that all golf course communities and golf courses have some type of online and social media presence. As mentioned earlier, many golfers use Google, Yahoo!, Bing and MSN to find courses. Most golfers get the urge to play a new course once or twice a month. If they have the funds and the time they will get out and play 18 holes multiple times a year. Whether or not a golf course gets this tee time could be determined by their search rankings. The golf industry has been slow to realize the value of ranking in Google search. So much so that some of my golf related blog posts outrank million dollar golf course communities. To rank on the front page of Google search for golf course related keyword phrases a course most offer something special in their web presence. Creating a “business card” type website will no longer cut it. With every Google algorithm change we have seen that updated, fresh content is necessary. The Google Panda, Penguin and Hummingbird updates have discounted links that have been purchased or manipulated. Google plans to rank websites that have built natural links and have authority in a specific industry. One of the ways in which a golf course community can build authority is to provide valuable resources to those accessing the website. This could include photographs, videos, audio files or written blog posts. Updating this type of content can be very difficult for a private, semiprivate or public golf course. Most golf courses do not have a technology or website staff that can update the website or a daily or weekly basis. Unfortunately, a monthly update is not giving website visitors much new information. To make it easier for golfers it may be a good idea to adopt some of the social media platforms. The sport of golf lends itself very well to almost all social media platforms. All social media platforms have adopted mobile applications which allow users the opportunity to update their status or photos from anywhere. Whether they are uploading pictures to Instagram or tweeting about the eagle putt they just hit there are opportunities for golf courses to increase engagement on social media. Google+, Twitter, Facebook, Pinterest and Instagram are all wonderful resources that will help any private or public golf course gain exposure. Ultimately, a golf course community or golf course must decide on their end goal when it comes to online exposure. A private course that has full membership does not need exposure. In fact, they are making money hand over fist on cart fees, golf shop sales, private instructor and private events. I have played on private golf courses that need absolutely zero help when it comes to marketing their course. They have had a full membership for several decades and there is a waiting list to become a member. On the flip side of that, there are a number of local public and private golf courses that would be more than willing to increase the amount of play on their course. We have all played courses that are completely empty. Some will advertise tee times on GolfNow, GolfLink or Golf18. These websites take a percentage of the greens fees as they assist golf courses in filling up the tee sheet. Unfortunately, these websites also offer tee times at a steep discount and most golf courses are making pennies on the dollar when golfers sign up through the website. Instead of getting referrals from other websites it would behoove a golf course community to book the tee time through their own website or over the phone. This way they can benefit from 100% of the profits. Posting on social media websites, especially Google+, will also help a golf course gain search authority. There have been no proven studies to show that Google+ engagement through +1s and reshares increase search ranking but it would make sense that Google would take this into account when deciding what businesses should show up for the keyword phrase “Myrtle Beach golf courses under $50”. When attempting to build a strong social media marketing campaign it takes quite a bit of time and, more importantly, strategy. There are plenty of people that will claim to be experts. Rather than hiring the first person that walks in the door or that cold calls it may be best for a golf course to do their own research. Find out if that particular company or individual is doing well on social media and in search. If you cannot find the “expert” for their own name it is time to run in another direction. Fortunately, there are a few great social media and internet marketing professionals that can greatly assist a golf course community. If you need help growing your presence online please reach out to me at jwojdylo@gmail.com. I have several packages available that include content creation, social media marketing and Google+/Google search exposure. I tailor the package to each individual client. Ultimately, the goal of all golf courses is to provide great service, allow golfers to have an enjoyable round and make money. There are numerous golf courses that are still in the red as they have yet to turn a profit. The only way they are going to turn a profit is to book more tee times or get more members. The extra exposure that is available online could be the difference in a golf course filing bankruptcy or profiting in 2014. The hardest thing to do is to get the ball rolling when it comes to a website and/or a social media account. Once the proper pieces are in place social media and Google+ engagement will start to grow. This type of investment will return profits over the course of time. Ranking in Google search has proven to be very valuable to many sports and entertainment venues. If your golf course is looking to ramp up and get more tees times in 2014 it might be time to get on social media. Making more money at a golf course could be the next step to starting the new housing development or building the multi million dollar clubhouse. For more information on how you can get more exposure through Google search and social media reach out to me at jwojdylo@gmail.com. Having been a member of a golf course for several years, I can tell you that booking a tee time online is wonderful. I do not have to pick up the phone and call anyone. I do not have to figure out my billing or credit card information. All I do is go online, put in my member number and book a tee time. Most golf course communities that offer this type of feature have some type of budget. If they are spending the money to update the website with this feature they should probably be promoting there great golf course through content such as photos or blog posts and sharing it to Google+, Facebook, Twitter and Pinterest. Unfortunately, most golf course communities still do not understand the power of showing up on the first page of Google search. In fact, I know several golf courses in North Carolina and South Carolina that are still in the red yet they have no desire to increase their search presence through Google, MSN, Bing, Yahoo! or AOL. It is crazy to think they are looking to add new members but they are not allowing new members to find them through search. If you are a general manager of a golf course community that is currently looking to add new members now is the time to increase content to show up in more Google searches. How Content Can Help a Small Business Online | What Apps are Available for Chromecast?